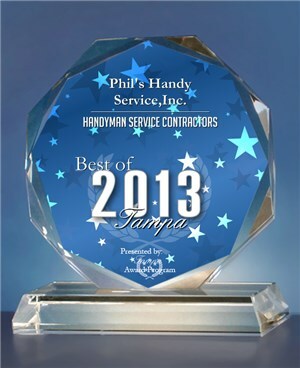 Kitchen and Bathroom Remodeling contractor Review page Tampa FL. Following a kitchen fire, I called Phil, who has worked with me on many jobs throughout the years both in my home and my office. No job is too small or too big. He handled all the details for a complete kitchen restoration due to fire and smoke damage: replaced drywall, painted ceilings and walls, replaced tile floor, sealed parquet floors (they are beautiful), and repaired smoke damage throughout the house. He was prompt, considerate of our needs, and responsive to questions. The actual restoration of the kitchen shows his technical skill as well as artistic skill given that our 1950s South Tampa home seems not to have a straight line in it. My family and I lived in our house during the restoration, and Phil made it easy to do so. I recommend him unreservedly. Many Handyman services claim to be number one but lack community support and online reviews. This is not the case with Phil's Handy Service. We let our customers tell our story. We are truly humbled by the overwhelming number of reviews our happy clients have posted all over the Internet. You can find them first hand on Google plus, Yahoo local, and Merchantcircle. Needed some rotten wood and beams replaced on back of house. Called Phil, left a message. He called back within a few minutes and we discussed the project. I also sent him pictures of the water-damaged wood. He said he could do the work and we arranged a time for him to come look at it. After looking at the damage, Phil moved my project up so it could be completed ASAP. Phil told me exactly what needed to be done. He and his helper showed up right on time to start project. Phil also arranged for gutter contractor to be available to put in new gutters. Every step of the way Phil kept his word and did an outstanding job. He even called a couple of days after finishing to ensure I was satisfied. He exceeded my expectations and I will certainly use him for future projects. Bottom line up front. Phil is trustworthy, professional and competent. He works hard to get you the most for your money (works hard to save you some too). Getting Phil involved with your project will set your mind at ease and get you the results you are looking for. 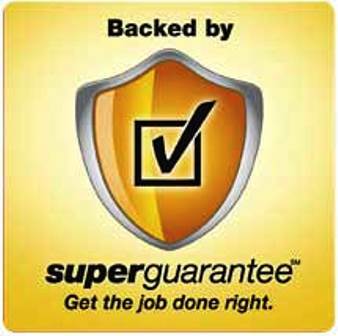 I chose Phil to help my family with a project (room addition/remodel) over three other contractors all highly rated like Phil. I don't make the decision to let someone in my house with my family lightly. Our experience: Phil listened to us and made some great suggestions while we were discussing the scope of work. He communicated with us throughout the project from the initial estimate, through scheduling, construction and final clean up. He was very conscientious of our kids' safety and the fact that we were living in the house during the remodel. He kept the work area safe and as clean as possible. He saved us several hundred dollars by finding a window for us instead of doing the easy thing and ordering it. We are new to the area and I called Phil to look at some electrical issues discovered by the home inspector. Chose him because of his good reviews online. Not only did Phil fix the problem, but he discovered other things that the inspector had missed. He also gave us a quick assessment of other things in the home and answered questions for free about other projects we need to have done. We are definitely using Phil in the future! He is honest and very good at what he does. Wasn't sure who to call and trust especially being out of town requiring work on a rental house but after reading all the reviews I put my faith in what was written. Happy to say they were correct and accurate in his response and professionalism. It was a complicated task to replace rotten joists under a house (crawl space) and he came prepared with a hazmat-looking suit and all, I visited the house a few weeks later and just as the pictures he took, all was done professionally and cleaned up. He also did the extra work to check with the tenant and look at the bathroom above make a professional assessment of the situation. After the work was completed he kept to the price as agreed and stated that there were additional minors tasks completed but that he would not charge. I could have gone cheaper but with the situation the way it was, I needed a professional and Phil was the man! I've tested 3 other contractors, handymen and all failed. I thank them for failing because they led me to Phil's Hand Service - first in class! I had a list requiring a wide array of skills which he completed in a timely manner while exhibiting great attention to detail. As well, he attended to several additional items that arose while he was working. He's very professional and provides enough information to leave you feeling confident in your choices. I will definitely call on his services again. Thanks Phil! Exceeds expectations! Phil has completed several jobs for us over the last year and we are more than satisfied. He is punctual, honest and always ensures the job is done right. 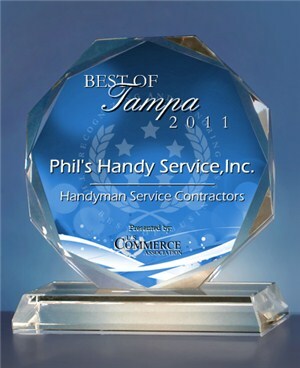 Phil is the ultimate professional and I would recommend his services to anyone who needs home repair/handyman services.